One thing all Washington Youth Tour winners have in common when they return home is sore feet! During their week-long trip to D.C. this year, students took more than 123,000 steps — walking a whopping 61 miles! So when asked to come up with a group community service project, it was no surprise the 2015 delegates decided to host a shoe drive. The students engaged their communities, family and friends in their efforts and jointly collected more than 100 pairs of new, youth-sized athletic shoes. 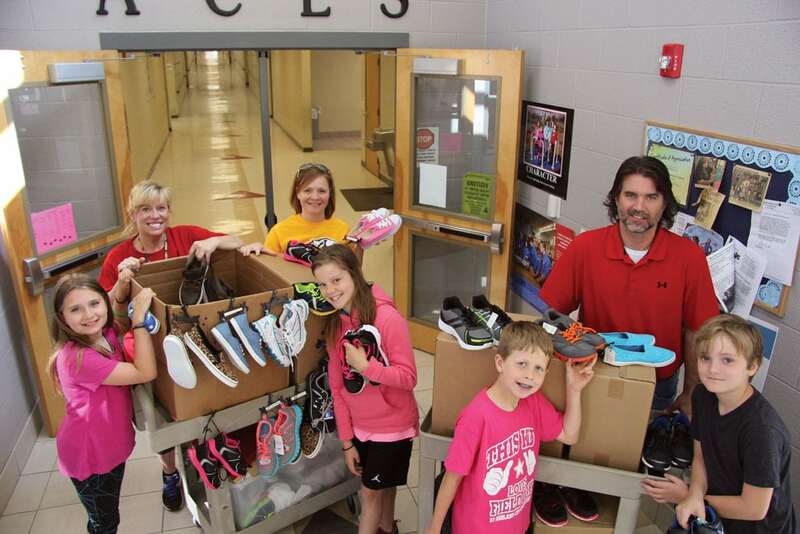 This was no ordinary shoe drive, though, as the students chose to donate the shoes to Ashland City Elementary, a local school in rural Cheatham County. Principal Chip Roney was overwhelmed by the generosity and excited about being able to distribute the shoes during the school’s upcoming open house event. That same excitement was shared by the students who gathered the shoes. “The amount of shoes we were able to collect will bring smiles to the faces of many children who otherwise might not get a new pair of school shoes this year,” says Eli Creasy, a 2015 WYT alumnus. Youth Tour participants often return to their hometowns as stronger leaders with confidence they can make a difference. The 2015 WYT delegates exemplified this through their dedication to this community service project.